Up until now I've been a spectator, watching the excavator guys do their work but lifting nary a finger myself. Today I was finally able to get my hands dirty and join the fun. 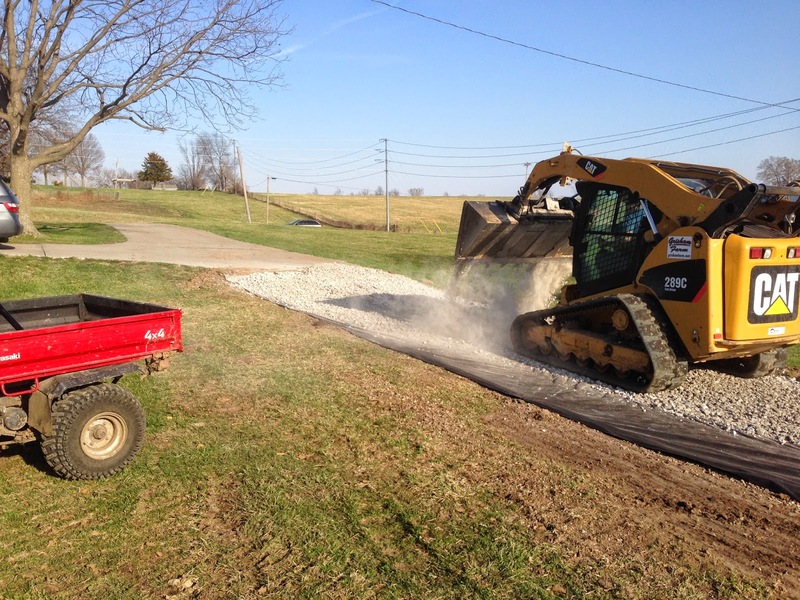 The excavators had graded and compacted the first 400 feet of driveway and were ready to start placing gravel. This meant that I needed to get the geotextile fabric in place. I had been warned that it was a very difficult thing to do when windy, since the 12.5 ft wide fabric turns into a sail and can easy pull you down the field. Hence, I was wary and thought I'd need some help. Fortunately, Steve and Kim's goat (my in-laws/neighbors...no, the goats aren't my in-laws, but Steve and Kim are...the goats I guess do count as neighbors) had twin babies the night before, so many of the relatives from the area headed up the farm for the evening. After getting their fill of baby goats, they were easy recruits for lending a hand. 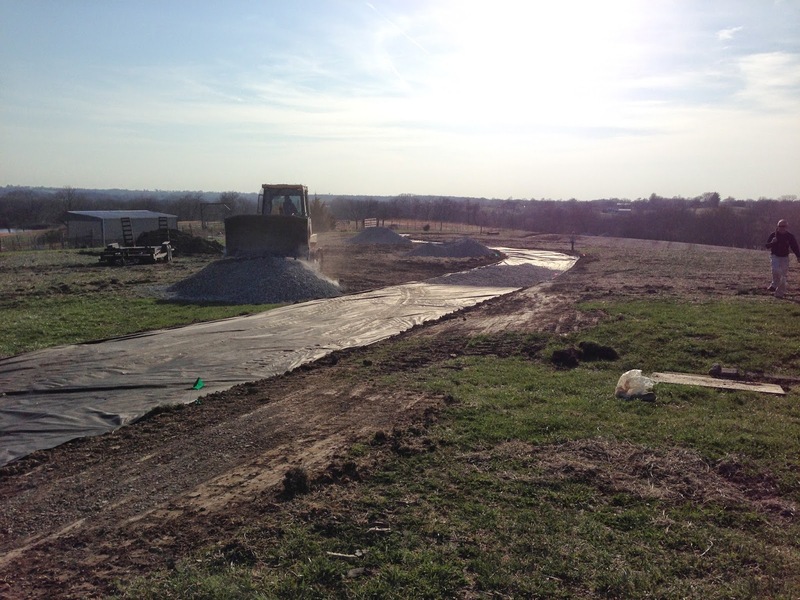 Our first task involved laying the geotextile fabric in place and rolling it out. I had the kids on hand to help stand on it since it was so windy, on the off chance that they might be able to get a birds-eye-view of the land should the fabric be carried airborne and the kids be lucky enough to hang on for the ride. Unfortunately, it was much less eventful in practice. We rolled out about 10 feet, stapled it to the ground with landscaping pins, and rinsed and repeated. The wind never got a chance to carry it off. After we got the fabric down, the loaders came in behind us and placed gravel on the fabric. After getting about 500' of the fabric down, we unrolling for the day as the grading was not complete for the remainder of the road. 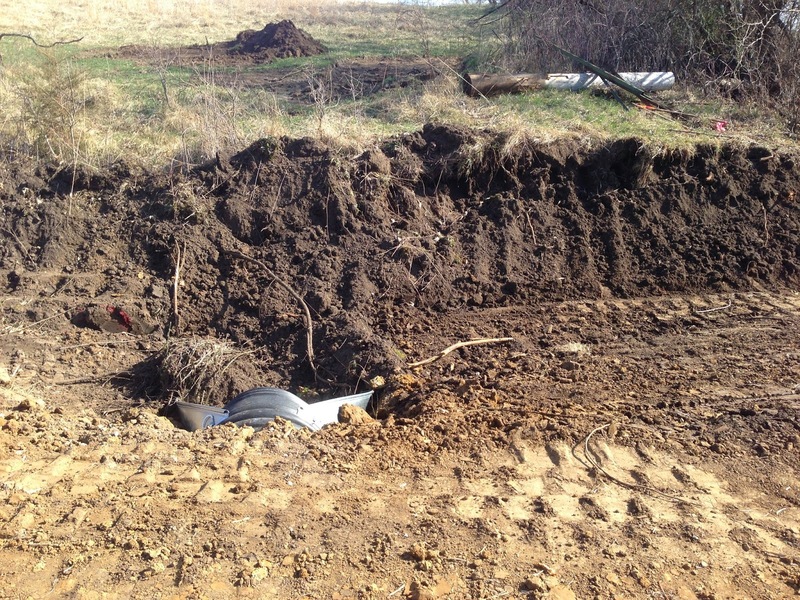 We then moved on to the ditch area, where the large culvert was placed. A corner of the hill was removed to make more room for the road. Unfortunately, there was a fence on that corner that had to be torn down. Since the farmer next door keeps a horse and a donkey on that pasture, we needed to get the fence back up as soon as possible. Fortunately, Paul, Matt and Mike were willing to help out with the chore. We loaded up the post hole digger behind the mule and headed off. It took until 9:00PM, but eventually we got the corner post set, two more wood posts, and four metal posts. We then uncoiled the barb wire (not a fun chore at night) and put it back up. It now looks better than new.